Carol Verny, Library Director, and Cathy Page, Circulation Supervisor, recently provided a demonstration of new automation solutions at the Haverhill Public Library. The new solutions were installed to allow circulation staff to better manage an ever-growing volume of transactions. Circulation has increased almost 35 percent in the past seven years at Haverhill PL; statewide delivery volume has increased by over 500 percent during the same period; while staffing levels in the library are down 50 percent! The efficiencies provided by this automation have freed up staff to better serve patrons, including a reopening of the Special Collections Department after an 11-month closure. All patrons now use self-check at five new workstations. Four are placed on the circulation desk and one is in the children’s room. Cathy Page said very few patrons need any help or instruction in the use of the new technologies. 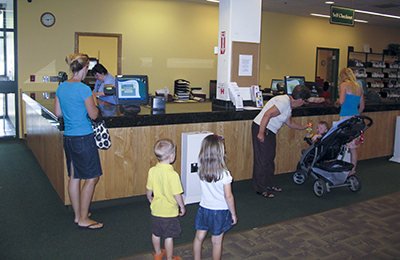 Patrons live in a self-service world and bring that experience to the library. Several vending machines are available to pay fines when necessary. Holds for patrons are placed on shelves next to the new self-check desk (formerly the circulation desk). 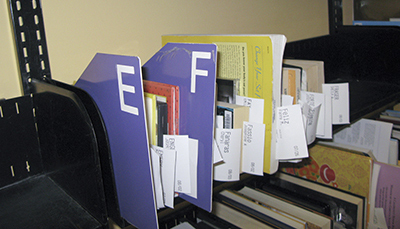 Items are placed spine down and sorted in alphabetic order by patron last name with large letter designators to assist staff and patrons in shelving and pulling items. 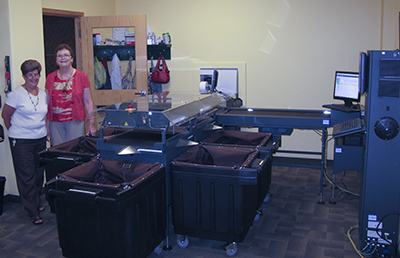 Cathy’s pride and joy is a new automated materials handling system (AMHS) in the back room behind the former circulation desk. Instead of dropping returns in a book drop, leaving them on a desk, or handing them to staff, patrons now put their returns into one of two return slots. One is located on an outside wall by the library’s main entrance, and the second is in the main entrance foyer. 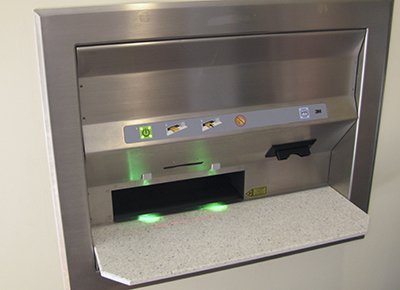 The system reads the barcode and checks items in; gives the patron the option of a printed receipt; and moves the items onto a belt to one of five bins to simplify processing by staff. Bins are currently designated for A/V, fiction, non-fiction, holds/transits, and other, but designations can easily be changed by staff. To facilitate self-check and the self-service return slots, the Library has purchased a barcode duplicator. Staff members and volunteers took weekly shifts to retrospectively place a new barcode on the front cover in the top left corner (horizontally). The project is now 80 percent complete.